Hasselblad Foundation supports a chemistry project at Alfons Åbergs Kulturhus (Alfie Atkins’ Cultural Centre) starting this fall – a project aiming to increase children’s interest and understanding of chemistry. Something that at first glance may seem difficult and incomprehensible will be explained through play and activity together with the children. In the project, researchers and students of Chalmers University of Technology, and pre-school and first grade pupils will meet at Alfons Åbergs Kulturhus in Gothenburg. The idea is that at a very young age arouse interest in science, and that Alfons Åbergs Kulturhus can be a complement to the school. The aim of the project is to create a positive image of chemistry, provide an opportunity for interaction and try out activities, and strengthen the teachers in their role as inspirers for the pupils. In the longer term, the project could contribute to increasing the number of young people pursuing chemistry studies at higher level. 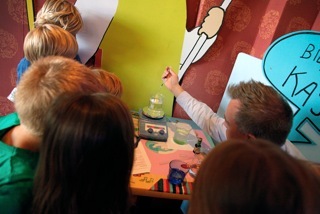 By using the body and the children’s curiosity we will teach children to use simple chemistry concepts, says Per Thorén, one of the initiators of the project together with Alfons Åbergs Kulturhus. Per Thorén is project manager and COO of Molecular Frontiers, an international network of researchers and educators worldwide with the aim to popularize science among the public, especially among young people. How small can water be? One of the questions Per Thorén asks the children is how many times you can divide the content of a bucket of water. Can you divide the water so many times that it eventually becomes invisible? The children will also get to try what it’s like to be a water molecule, and learn how water molecules move when they are cold and warm – a good way to illustrate what happens when water freezes or boils. Alfons Åbergs Kulturhus (Alfie Atkins’ Cultural Centre) is a creative cultural centre for children and their adults. This is a place where inquisitive children can play, get up to mischief, climb and discover a building full of fascinating things. There are daily activities on offer, including theatre, design, maths with seeds, music, kids’ workouts and discovering pine weevils. The Hasselblad Foundation is now funding a visiting professorship at the new Department of Marine Sciences at the University of Gothenburg. The visiting professorship goes to the leading American researcher Jody Deming, who is an authority on polar marine research. “I am so pleased that we are able with the help of the Hasselblad Foundation to attract a researcher who is a world leader in her field,” says Leif Anderson, marine chemist and Professor at the University of Gothenburg. Thanks to the Hasselblad Foundation, the University of Gothenburg now has a leading researcher attached to the new Department of Marine Sciences which will be opened on 1 July. Visiting Professor Jody Deming is coming to us from the University of Washington, and her specialist area is the adaptation of marine microorganisms to the cold. 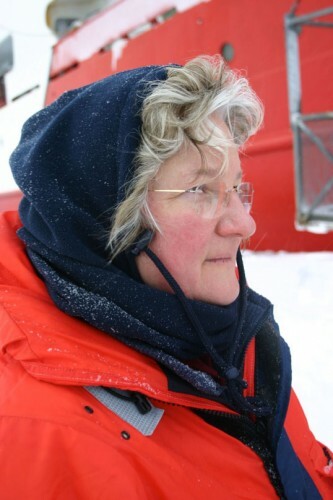 “She is the person best suited to be our first visiting professor because her specialist area in marine microorganisms and their importance for polar geochemistry and ecology fits in well with the direction we are taking at the University of Gothenburg,” says Leif Anderson. The Hasselblad Foundation’s funding for a visiting professor in the Marine Sciences will encourage the linking up of researchers from different disciplines in the new Department of Marine Sciences, which will become a reality at the University of Gothenburg on 1 July. For more than thirty years, polar marine research has been a key area of study for researchers in the Faculty of Science at the University of Gothenburg. Jody Deming, who is a microbiologist and has a wealth of knowledge in DNA research, will be holding a third-cycle course in October for everyone interested in the field of marine science, and she will also hold a symposium on 3-5 November. The Erna and Victor Hasselblad Foundation’s grants for female postdoctoral researchers in the natural sciences at Chalmers University of Technology and the University of Gothenburg. For the fifth consecutive year, the Hasselblad Foundation is allocating funds to support female postdoctoral researchers in the natural sciences with a possible extension to adjacent scientific fields and life sciences. Grants may be applied for by female researchers employed at any one of the aforementioned universities on terms to be announced shortly. The grants total SEK 2 million for two female postdoctoral researchers of SEK 1 million each. Approved funds are to be regarded as contributions to each respective researcher’s postdoctoral project to be paid successively to the respective university over a maximum period of three years. The main aim of the Erna and Victor Hasselblad Foundation is to promote research and scientific teaching in the natural sciences and photography. This aim is achieved, in part, through research grants to the natural sciences as well as providing photography fellowships and an international award in photography. For the third year running, the Hasselblad Foundation announces financial support for continued research support for women with PhDs in the natural sciences with a possible extension to closely related fields of technology and life science. This funding may be applied for by women researchers employed by Chalmers University of Technology, University of Gothenburg or Karlstad University, in accordance with terms and conditions soon to be announced. The total sum of this funding is SEK 2,000,000, to be divided as SEK 1,000,000 each for two women researchers. When granted, the financing is to be regarded as project funding to support the continued research of each of the two researchers, and is to be paid out to the respective universities during a period not exceeding three years. The Hasselblad Foundation supports the snowy owl. During 2012 the foundation decided, as one aspect of the well-established collaboration with Nordens Ark, to endow a chair at the University of Gothenburg, with the professor’s place of work at Nordens Ark. The chair is held by Professor Claes Andrén, scientific director of Nordens Ark since 2006. Professor Andrén works with research in conservation biology, tutoring students, developing the capacity and competence of the staff at Nordens Ark in terms of raising and maintaining viable populations of threatened species in bio secure conditions. He also conducts methodical follow-ups of animals that have been released, in order to better understand why some release programs succeed and others fail. This knowledge is of major international significance, highlighting the role of conservation biology in terms of ensuring viable populations of threatened species in natural environments. The Hasselblad Foundation announces financial support of SEK 1,000,000 each, to Anna Martner, PhD, University of Gothenburg, and Elin Esbjörner Winters, PhD, Chalmers University of Technology. Anna Martner’s research focuses on myeolid leukemias, a research field that she wants to develop further by collaboration with hematologists and immunologists at the Sahlgrenska Academy. In particular she studies how leukemic cells can avoid being eliminated by the cytotoxic cells of the immune system, with the aim of formulating principles for improved immunotherapy. She intends to recruit a PhD student, as a first step in establishing a research group. Elin Esbjörner Winters is studying the pathology of neurodegenerative diseases such as Alzheimer’s disease, at molecular level. Her aim is to develop new methods for the study of the behaviour of proteins in living nerve neuronal cells, specifically the development of harmful protein aggregate structures. She intends to involve other researchers with supplementary competence in interdisciplinary work both in her own research group and through international collaboration. One of the objectives of the Hasselblad Foundation is to promote research in the natural sciences. As part of this important work, we are pleased to be able to announcing this funding to Anna Martner and Elin Esbjörner Winters for continued research qualification. Nordens Ark received a grant of SEK 1,900,000 to endow a chair in conservation biology, applied research in the maintenance of threatened species, and to run an annual research school. During 2010 the foundation decided, as one aspect of our well-established collaboration with Nordens Ark, to endow a chair at the University of Gothenburg, with the professor’s place of work at Nordens Ark. The chair is held by Professor Claes Andrén, scientific director of Nordens Ark since 2006. Professor Andrén works with research in conservation biology, tutoring students, developing the capacity and competence of the staff at Nordens Ark in terms of raising and maintaining viable populations of threatened species in bio secure conditions. He also conducts methodical follow-ups of animals that have been released, in order to better understand why some release programs succeed and others fail. This knowledge is of major international significance, highlighting the role of conservation biology in terms of ensuring viable populations of threatened species in natural environments. The Gothenburg Museum of Natural History has been granted a contribution of SEK 500,000 to be used for publishing its unique scientific material, consisting of about 2,000 pictures of animal species, on the Internet. Having the pictures published on the Internet will not only make it easier for taxonomists and other scientists, as well as for an interested public, to have access to this unique material, but it will also protect the material from damage and the risk of theft. Universeum has been granted a contribution of SEK 2,000,000 to carry out the project The Innovation Workshop—with nature as inspiration. The project focuses on creativity; to create something, test and evaluate it. A major exhibition, opening on October 13, 2011, will have a central area of activities, surrounded by creative exhibition displays, demonstrating how nature has been the model for human inventions and applications. The Institute for Technical Design at Chalmers and HDK at the University of Gothenburg are participating in developing the program. The foundation has decided to earmark SEK 2,000,000 to finance the continued research qualification of two female scientists who are defending their doctoral theses in the natural sciences (SEK 1,000,000 each), with the possibility of extension to closely related fields of technology areas and life science. The intention is to repeat this earmarking opportunity for five additional years. The approved grant is a contribution for each scientist’s continued research qualification and should be used to support the scientist’s projects. Each scientist must be employed at Chalmers University of Technology, the University of Gothenburg or the Karlstad University. Further information about applying for the program can be ordered from the respective universities. In October 2011 the board decided, within the above mentioned framework, to grant financial support to Åsa Haglund, PhD, Chalmers University of Technology, and Caroline Jonsson, PhD, University of Gothenburg. The foundation has decided to grant SEK 16,000,000 over a four-year period to enhance didactics in natural science subjects. Three universities in the west of Sweden—Chalmers University of Technology, University of Gothenburg and Karlstad University—have undertaken to cooperate during a four-year period in a programme to raise the quality of didactics in courses dealing with molecular science in chemistry, physics and biology. The intention is to develop research and graduate teaching in the didactics of molecular science within the framework of the Hasselblad Foundation Graduate School. The programme also involves participation in the development of Molecular Frontiers, a worldwide project based in Boston. This deals with natural science didactics and focuses in particular on subjects in which molecules are a shared “language”. The universities will be able to use this grant to fund graduate students, graduate teaching, seminars, training courses and their participation in the Molecular Frontiers project. The programme has been developed through the intensive and enthusiastic cooperation of a group of researchers from the three universities. The proposed Hasselblad programme mainly comprises a research project in which six to seven active graduate students will each have supervisors from two complementary disciplines, the natural sciences and educational theory. Schools and teachers in the region will be encouraged to participate and will receive support in developing their own teaching methods. The links with primary and secondary schools and the planned training courses and seminars will enable the knowledge generated to be used not only for research, but in a much wider context. 2007–2008 Nordens Ark received SEK 2,400,000 to the Amphibian Ark project. 2009 University of Gothenburg Department of Zoology received a grant of SEK 200,000 for the project Evolution of sociality and altruism in waterfowl. 2006–2009 The endowed chair Hasselblad Professor of Public Learning and Understanding of Science (PLUS) was granted SEK 9,000,000. 2005 Universeum received SEK 800,000 to develop equipment for the illustration of modern scientific and technical aspects of energy. 2004 Nordens Ark received SEK 1,800,000 to establish research activities in the discipline of biodiversity and threatened species and races. 2004 University of Gothenburg received SEK 1,800,00 to establish a molecular biophysics laboratory in conjunction with the Swedish NMR Centre and the Hasselblad Laboratory. 2003 University of Gothenburg and The East Indiaman Götheborg received a joint grant of SEK 3,000,000 for research in marine biology in conjunction with the maiden voyage of The East Indiaman Götheborg to China. 2002 Tjärnö Marine Biological Laboratory received SEK 3,000,000 for the establishment of a Centre for Communication in Marine Biology. 2002 Universeum received SEK 6,000,000 for projects entitled: Communication from an evolutionary and technological perspective, Chemical principles and phenomena from the world of molecules and The Paths of Toxins. 2002 Tjärnö Laboratory and Universeum received a joint grant of SEK 1,000,000 to develop interactive exhibition components and other information on communication in marine biology. 2001 University of Tartu, Estonia, received SEK 3,000,000 to supplement research equipment, such as a scanning probe microscope with atomic resolution for low temperatures, etc. 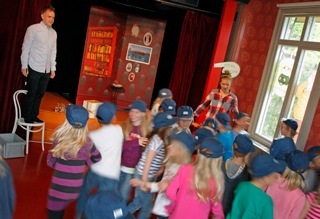 2000 Universeum received SEK 6,000,000 to support teaching and research in the natural sciences. 1999 Stockholm University received SEK 6,000,000 to establish a mass spectrometry facility for biological and chemical research in “proteomics work”. 1998 Technical University of Denmark received SEK 6,000,000 for the establishment of a research centre, the Centre for Biomembrane Physics. 1997 Åbo Academy, Finland, received SEK 6,000,000 for the visualization of biological signal processes in respect of molecules, cells and tissues with the aid of three- and four-dimensional computer techniques. 1996 University of Bergen, Norway, received SEK 5,000,000 to facilitate the development of a remote-controlled submarine with land-based equipment. 1996 Hasselblad Laboratory: a donation of SEK 20,000,000 was made to University of Gothenburg to build the Hasselblad Laboratory at Medicinareberget, on the campus of the Medical School of University of Gothenburg. During 2010 the foundation decided, as one aspect of the well-established collaboration with Nordens Ark, to endow a chair at the University of Gothenburg, with the professor’s place of work at Nordens Ark. The chair is held by Professor Claes Andrén, scientific director of Nordens Ark since 2006. Professor Andrén works with research in conservation biology, tutoring students, developing the capacity and competence of the staff at Nordens Ark in terms of raising and maintaining viable populations of threatened species in bio secure conditions. He also conducts methodical follow-ups of animals that have been released, in order to better understand why some release programs succeed and others fail. This knowledge is of major international significance, highlighting the role of conservation biology in terms of ensuring viable populations of threatened species in natural environments. The Erna and Victor Hasselblad Foundation decided in 2004 to endow a chair to be designated the Hasselblad Professor in Public Learning and Understanding of Science (PLUS) in honour of the Victor Hasselblad centenary. It was also decided that the chair was to be shared between Chalmers University of Technology and University of Gothenburg. Recruitment for the position took place during 2005. The subject Public Learning and Understanding of Science may include studies of public understanding and attitudes towards science and technology, science in schools, science and the media, and science and gender. Dr. Ilan Chabay became the first Hasselblad Professor of Public Learning and Understanding of Science. On the occasion of the 100th anniversary of Victor Hasselblad’s birth, March 8, 2006, Dr. Chabay delivered his inaugural lecture in Gothenburg.